Disney has a habit of creating a sense of urgency when releasing videos of its classic animated films. For the third time since 1999, Peter Pan will be available on DVD for a limited time; though if you miss this edition, a new improved version will likely be out in a few years. The bonus features on this latest Platinum Edition two-disc set are hit-or-miss. But this one is priced to sell, and it’s a good value for fans or their parents. This film is one of numerous adaptations of the familiar tale which began as a play by J.M. Barrie. The Darlings, who live in London of about 100 years ago, are also familiar with Peter Pan’s adventures. As the movie opens, young Michael and John are playing “Peter Pan.” They and their sister Wendy aren’t very surprised when Peter turns up in the flesh later that night, in search of his shadow which is hiding in a dresser drawer in their nursery. Soon, they are flying off to Neverland. Populated with mermaids, Indians (the American kind) and pirates, it’s a place where Peter and his Lost Boys have endless adventures. Captain Hook and his nemesis, the crocodile, provide some menace — it’s mostly comical, but might be scary for young children. There is a little bit of angst about growing up, though it seems to have less emphasis than in other versions of the story. The bright, cheery colors match Peter’s happy-go-lucky attitude. It’s fluff, to be sure, but it is an enjoyable romp. The only special feature of interest on disc one is a commentary track, “Hosted by Roy Disney.” It’s actually a collage of interviews with animators and actors who worked on the movie as well as some film historians (including the ubiquitous Leonard Maltin, described by Disney as “America’s favorite critic”). Disney provides some verbal segues and identifies who is speaking. At first, the comments aren’t too promising — we get to hear how great the movie is. But it gets better after about 10 minutes, when the interviewees start talking about their experiences working on the movie. 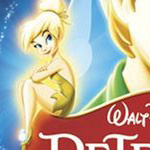 Also on the first disc — and skippable — is a DVD storybook and a sneak peak at the upcoming Disney movie Tinker Bell. On disc two, the most interesting feature is “The Peter Pan That Almost Was.” Veteran Disney animation directors Ron Clements and John Musker look at old drawings, paintings, meeting transcripts and other materials related to Peter Pan. Walt Disney started developing the movie in the late 1930s, and many approaches to the story and visual styles were considered and discarded throughout the years. “You Can Fly: The Making of Peter Pan,” gives an overview of the making of the film. At 15 minutes, it hits the main points without getting bogged down with details. This disc has three other making-of features, which repeat much of the information already introduced. In the Music and More section of disc two, a segment about a deleted song is worth a look. The two music videos also in this section are of little interest. Camp Never Land games (which includes some simple sudoku puzzles) is geared toward young children. There is a read-along feature as well, which plays the entire movie with English subtitles done in the style of a children’s book. It looks like a fancy way of closed-captioning the movie. The picture is flawless. According to the DVD box, it’s been restored, though there is no indication as to what it looked like before the restoration. For sound, the DVD offers a choice between the restored original theatrical (monaural) soundtrack or a Dolby Digital 5.1 enhanced soundtrack. Not surprisingly, the surround track sounds better. After watching the movie. Pop in the second disc and watch “You Can Fly.” Then check out “The Peter Pan That Never Was.” If you must know more about the making of the movie, watch the movie with the commentary track some other time. Then turn it over to the kids.